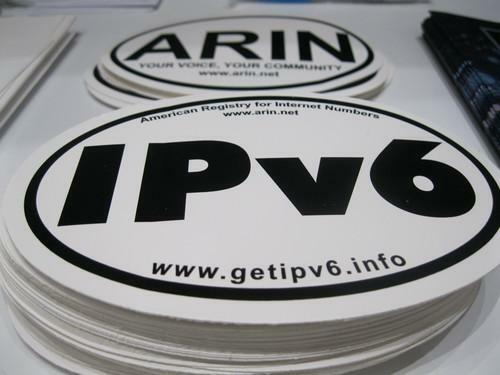 The American Registry for Internet Numbers gave out IPv6 stickers at its meeting last week in San Francisco. The stockpile of unused IPv4 addresses in North America has fallen so low that there's now a waiting list. On Wednesday, for the first time, the American Registry for Internet Numbers (ARIN) had to tell an applicant for new Internet addresses to wait. ARIN simply didn't have any blocks of addresses big enough to satisfy that applicant's needs. This day has been coming for some time, according to ARIN President and CEO John Curran. It's a step on the path toward total depletion of Internet Protocol Version 4 addresses, the type that most devices on the Internet still use. IPv4 only has about 4.3 billion addresses, and the so-called "free pools" administered by official Internet registries like ARIN are close to running out. There are only about 150,000 addresses left in the pool at ARIN, one of five regional Internet registries around the world. Some may get returned if an address holder goes out of business or fails to pay its dues, and there will be a few more distributions from a global pool run by the Internet Association for Assigned Names and Numbers. How much will come in from either of those sources isn't clear. Meanwhile, requests for IPv4 addresses are on the rise, according to ARIN, which is not surprising given the prospect of supplies running out. The growing demand and dwindling supply could lead to total depletion within weeks, Curran said. To prevent one big user from snapping up everything that's left, ARIN only gives out one block of addresses at a time. ARIN is getting about 400 requests per month and has a little over 500 blocks of addresses left, so it's likely to run out in about a month, Curran said. ARIN put the waiting-list system in place more than four years ago, knowing this day would come. For now, getting waitlisted is mostly a problem for bigger entities. All the blocks left in ARIN's free pool now are relatively small, with 512 addresses or less. That's too small for some large ISPs and enterprises to bother with, so they tend to put in requests for bigger blocks, Curran said. ARIN won't identify the first applicant it had to turn down. It may be an Internet service provider, a company or an organization. Whoever it was, ARIN verified that it really needed the addresses and approved the application. Now that applicant can either take a smaller block than it wanted or hope something bigger shows up at ARIN later. Those that can't get big blocks from an official source may turn to the transfer market, where enterprises and service providers with more addresses than they need can sell them through a broker. But like the ARIN waiting list, that too holds some uncertainties. The only real solution, ARIN says, is IPv6. That new protocol allows for an almost unlimited number of possible addresses -- more than 1 trillion for every known star in the universe, the group says -- and organizations can get them from Internet registries right now. Some of the biggest names on the Internet are already using IPv6, but some IT departments have put off the transition because it can be time-consuming, expensive and hard -- for now, at least -- to justify.